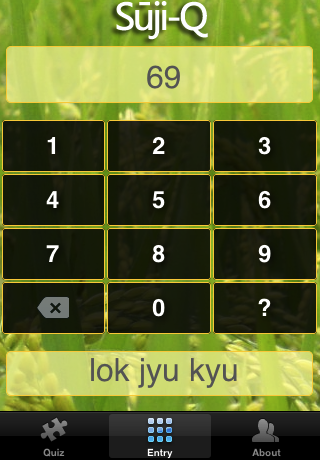 Suji-Q is a simple application to help you learn your Japanese numbers. 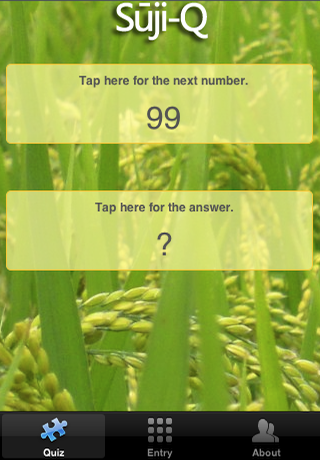 It includes a Quiz mode so you can test yourself, or an Entry mode so you can quickly 'LookUp' a number. Numbers are spelled for you in english characters so you can practice saying them as well. The inspiration for Suji-Q came on a recent trip to Japan. My wife is Japanese, so she was an invaluable guide to this apps creation. While we were in Japan, I noticed that I could pick out the numbers in conversations that people were having around me, and once I got the numbers, I could kinda figure out what the conversation was about. So I wrote Suji-Q to quiz myself. The name came from the Japanese 'Suji' ( or 'Suuji' ) for number, and 'Q' for quiz. All graphics, images and artwork are pictures my wife and I took while in Japan.